nother wonderful video trailer for a wedding on Lake Orta! Nicola and Tom’s wedding video. 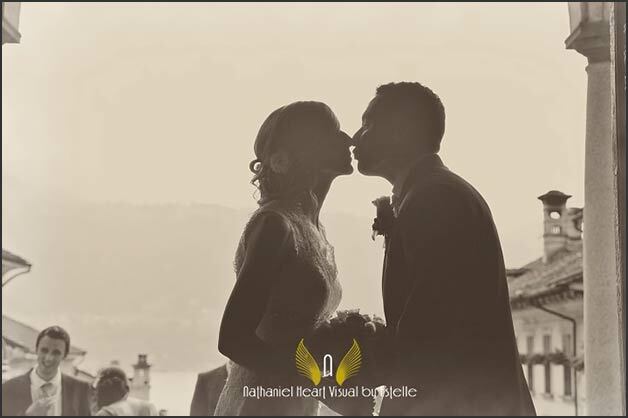 With Charlotte and Steven’s one, these two wedding videos shot on Lake Orta can really give you a full idea Orta romanticism and the wonderful beauty of nature you can meet her. If you are keen to get married on Lake Orta but you do not know which one to chose we are sure you will choose Lake Orta after seeing this wonderful wedding movie. Wedding planning is by our wedding planner for Lake Orta, Valentina. Floral decorations in Assunta Church, bridal bouquet and bridesmaids’ bouquets and centerpieces for the reception at Ustaria Ca dal Rat are all by La Piccola Selva Floral Designer. Nathaniel By Estelle Team of video maker realized a fantatic wedding video trailer for Nicola and Tom! Lake Orta deeply thanks them too. It is more splendid than ever! Back to Ustaria Ca dal Rat for a wonderful wedding by the shores – with video footage! I know I told you about a wedding to Ustaria Ca dal Rat many times but we never get tired to have weddings there! The venue is really charming, view is amazing and food is delicious: it could be a perfect venue if you are looking for a relaxed and laid down event on Lake Orta. This time we have something new to show you! A lovely video for a sweet wedding we recently planned in Orta. We are talking about Nicola and Tom’s wedding.